I’ve just realised that I thought shopkeepers in France were telling me to have a good day, not a “good journey”. Having friends around the world is such a gift and my French is minuscule and paltry but I’m learning each day. A nightmare last night about a French countryside grizzly bear chasing me has me up at this unseemly hour of 2AM. French grizzly bear?! Yes, just outside Paris apparently. I was trying to escape him with my 5 minute jet propulsion pack. The tropical night breeze in Houston is pleasant, so I am in my balcony garden, writing and listening for traffic accidents. I realised that I could text my friend in France since now it’s 9 AM. I type my message in English without slang and voila!, a French message appears. I copy and paste that message into the text message and send. A small knowledge of French is helpful to be certain that there aren’t major errors, although I suspect there are. Idioms are sayings that cultures have. In the US, we have some that don’t translate even across our nation. When I started graduate school a long long time ago (hint: my nephew has just begun grad school), I met a lifelong friend from Arkansas. She and her accent were adorable as she said “like a duck on a Junebug!” which I soon learned meant “I will start on the work right away!” Puzzled, I asked her to repeat several times then finally said “what’s a Junebug?” You see, west of the Rocky Mountains, there are no harmless, round, wobbly flying bugs that end up in your hair in June. The funny thing is, she now has a Northern accent and I have a Southern one. The same goes in France. Many of the idioms involve cats such as “a cat in your throat” instead of a frog. My first frog cusine was in Houma, Louisiana-Cajun country and home base for helicopters to offshore rigs. So, that’s weird. I’m off topic now so I have “jumped from the rooster to the donkey”. 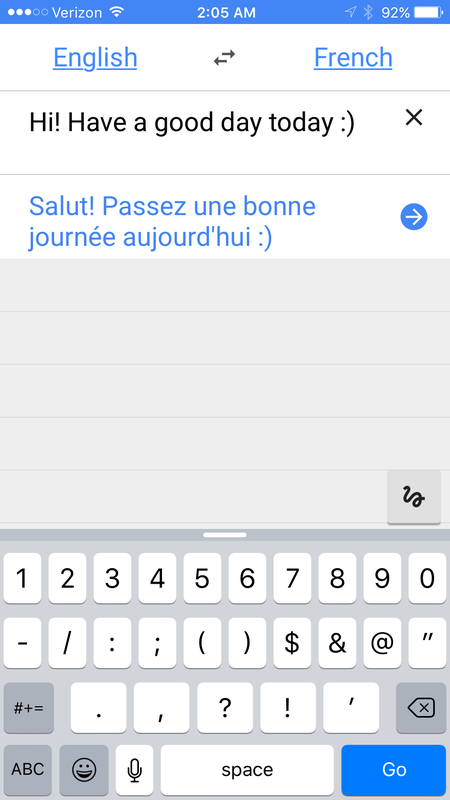 Google Translate app – where was this technology when I was taking Spanish Composition 304?